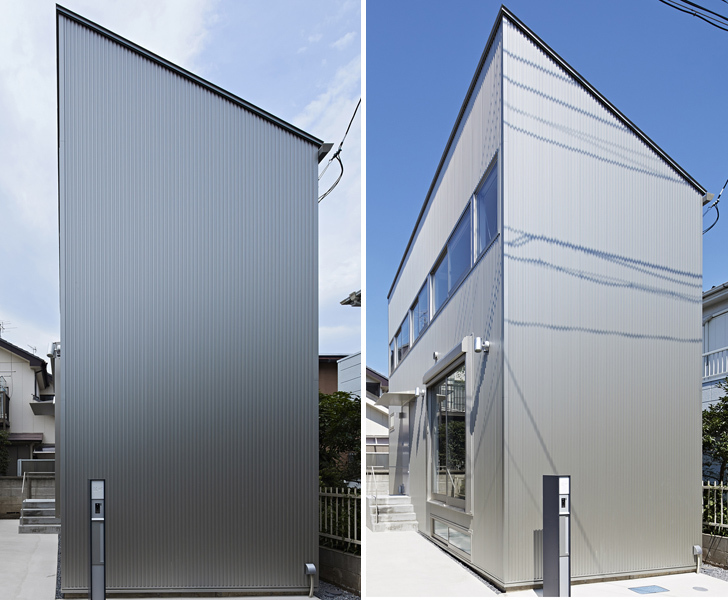 Houses designed to protect residents' privacy are nothing new in Japan, but this one does it with a front facade that is completely devoid of windows and doors. The Long Window House was designed by Tokyo-based studio Another Apartment for a tiny 58 square-meter plot enclosed by houses on three of its four sides. From the road it looks like just another featureless building in the city, but inside there is an abundance of natural light, ventilation, and — most importantly – privacy. A spiral staircase with cantilevered treads and a minimal handrail links the ground floor with the upper story and a basement level designated for use as a home theater. Upstairs is a multi-purpose space that can be separated into two bedrooms with sliding partitions that disappear into the wall when not in use. The upper level is located “a little higher than the ground level,” which reduces visibility through the windows that span the length of the room on the south side. On the opposing wall there is a hidden sink and built-in storage to maximize the room’s available space. Kobayashi said the room “has an atmosphere like a broad veranda as a whole,” which makes it an ideal place to relax away from prying eyes in the city. 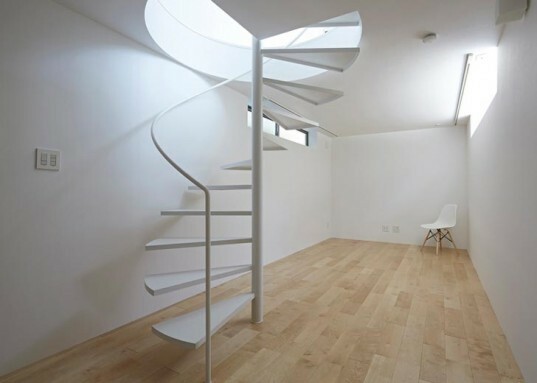 A spiral staircase with cantilevered treads and a minimal handrail links the ground floor with the upper story and a basement level designated for use as a home theater. The entrance opens into the living room, where the layout more than makes up for the faceless north side with a full-height sliding window that can be opened out onto a narrow patio. Upstairs is a multi-purpose space that can be separated into two bedrooms with sliding partitions that disappear into the wall when not in use. The upper level is located "a little higher than the ground level," which reduces visibility through the windows that span the length of the room on the south side. Another Apartment's Long Window House is nestled into the northern edge of its site, and the main entrance and windows are located on the south-facing sidewall.